Create a simple web application serving a json in beego, a golang web application framework. You can write a decent web-application using core Golang language. Yet, coding enterprise applications require above features. Instead of composing these from independent sources, you can use Beego which comes bundled with all of these. If you are coming from Python ecosystem, Beego is like Django. dep is the dependency management tool in Golang. We will use dep to install and upgrade the dependencies. Let us initialize our repository with dep init. I wrote about dep in an earlier post. Read it to understand how to use dep. Now it is time to install beego. Install beego with dep. 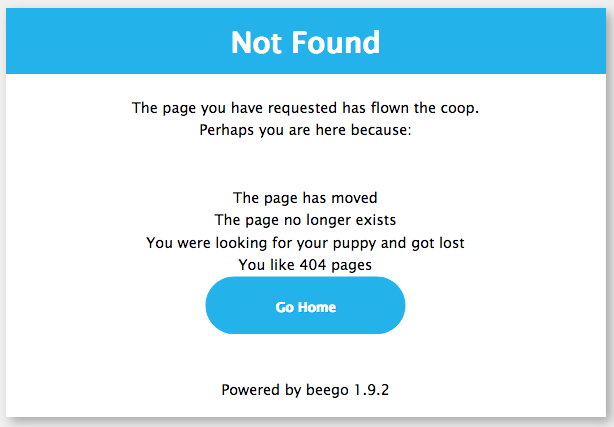 It will install beego under vendor directory. It is recommended to store this directory into your version control system. Now we can start writing a web-server. Modify the main.go file with the below content. If you open http://localhost:8080 you will see an error message, like in the following image. What is happening? The above code-snippet created a web-server but that server doesn’t know what to do with an incoming request. Let us code that part. beego.Controller has methods for handling REST methods (get, post etc). We create a MainController by embedding (like inheritance in other languages) beego.Controller. We overload only Get method. In this method we are just writing a string as an output. We, then, register this router (for Get method) and bring up the server. You can run this code by go run main.go. If you open the browser to http://localhost:8080, you will see a hello world. Beego also supports serving json, xml as responses. Let us modify the above program to serve a json. This is only a tip of Beego framework. If you want to learn more, subscribe using the below form.